Ringo H.W. Chiu File - In this Aug. 9, 2018, file photo, firefighters keep watch the Holy Fire burning in the Cleveland National Forest in Lake Elsinore, Calif. Researchers have expanded a health-monitoring study of wildland firefighters after a previous study found season-long health declines and deteriorating reaction times. 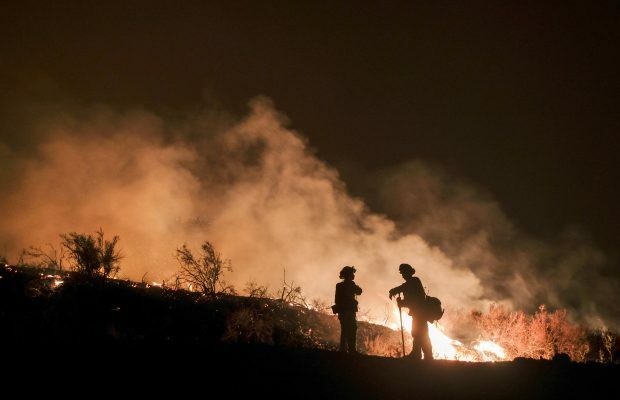 BOISE, Idaho — Randy Brooks’ son had a request three years ago: What could his dad do to make wildland firefighting safer?To Brooks, a professor at the University of Idaho’s College of Natural Resources who deals with wildland firefighting, it was more of a command.